For a better mobile experience, please use our app. Tap an icon below to download our Android or iOS app. These two high quality, two bedroom apartments have been completed as part of the first phase of development at Prosperity House. They have been provided by Prosperity at a signficant discount and have been taken up by an experienced LandLord who is also a CrowdLords member. The LandLord has a portfolio of 23 other properties in various locations around the country including one nearby in Nottingham. He has decided to offer Interim Equity for a period of 12 months after which time he will decide whether to sell or refinance the apartments. In return for their investment Investors enjoy a share of income and a share of any capital gain at the end of the investment term. With this investment the Income yield is paid quarterly and is projected to be 2.8% p.a. paid by way of Dividend, and the capital gain will be a share of 75% of the increase in vale, projected to combine to deliver a total return of 21.3%..
An opportunity to invest in a central Birmingham new build development of premium one and two bedroom apartments. This significant development in a prime location will deliver 31 units to meet the needs of young professionals looking to rent in the city centre. The development will start this summer and is due to completed in Q1 2019. All units have been pre-sold by Prosperity to their investment buyers and will be delivered under a fixed price JCT contract. Prosperity are raising equity for the purchase of the site (Subject To Planning) and in return offering a fixed return of 13.5% p.a. using our Interim Equity arrangement. In return for an investment, holders of Redeemable Class B shares will receive 17.6% of their share of the profit which equates to around 16.8% of projected net profits after tax. This will be paid as a capital gain when the shares are redeemed at a price of £1.27 per share, on or before the 31st March 2019. An opportunity to invest in the development of a collection of stylish new homes consisting, in total, of 43x, 2 and 3 bed houses and 103x, 1 and 2 bed apartments. This significant development by Prosperity will bring much needed housing stock to meet the demand from first time buyers as well as from the rental market. The development will be carried out in four phases and a proportion of each phase has been purchased by Prosperity to be sold onto investment buyers. We are raising equity for the purchase of the site (Subject To Planning) in tranches linked to each Phase. Phase 2 will provide 17x, 2 bed houses and 3x, 3 bed houses, all to be completed within the first 18 months of the build program. All the 2 bed houses are pre-sold to Prosperity generating nearly £2m of sales revenue, and the 3 bed houses will be sold off-plan to local buyers. The developer has secured the site and is contributing £300k of the total equity, with the remainder coming from CrowdLords Investors. In return for an investment in this Phase, holders of Redeemable Class C shares will receive 45.6% of their share of the projected profit which equates to around 39% of projected Phase 2 net profits, after tax. This will be paid as a capital gain when the shares are redeemed at a price of £1.30 per share, on or before the 28th February 2019. This is an opportunity to invest in the purchase and conversion of a Grade II listed, ex-Baptist Chapel in Swansea. The Developer wishes this to be a Buid-to-Rent project and so has opted to use Interim Equity. The property has been vacant for a couple of years and requires significant, but non-structural, work to the roof and the exterior along with extensive groundworks. The interior will be converted using high quality finishes to deliver 15x, 1 bed apartments and 2x, 2 bed maisonettes, along with 20 parking spaces. As this is an Interim Equity investment it will be by way of Redeemable Shares, to be purchased by the SPV, at a price that delivers a return of 21.9% p.a. The projected Investment Term is 12 months but can, at the discretion of the Developer be between 10 months and 15 months. An opportunity for Investors looking for above average capital growth to invest in 4x, 2 Bed apartments in a purpose built block in Lincoln City Centre. The apartments were acquired as part of a trade-in and rather than selling them now, the owner would like to retain them for a further 3 years and is seeking investors to join him. All four properties are let under ASTs at a monthly rent of £550 and will be purchased at a price that is 23% below current market value. The strategy is to hold all four units for 3 years and to improve the monthly rental to current values. The flats will be managed by specialist agent Complete RPI who are confident they can achieve these increases. The investment is leveraged at 55% LTV, and whilst this suppresses the annual income, it does optimise the capital growth. Investors will receive Ordinary Class B shares which entitle them to their share of 95% of income after costs, paid annually in arrears and 75% of their share of capital growth, combining to give a projected total return of 42.7%. This is a rare opportunity to invest in a new build development that is already underway in central Birmingham. Equity is being raised to replace mezzanine finance used to acquire the site along with the preparations for construction. This prime five and six story development will deliver 63 apartments together with commercial space on the ground floor and 18 car parking spaces. There is also a shared, secluded courtyard space at first floor level. Works started on site on 15th November 2016 and is due to be completed during March 2018. All units have been pre-sold by Prosperity to their investment buyers and is being delivered under a fixed price JCT contract. 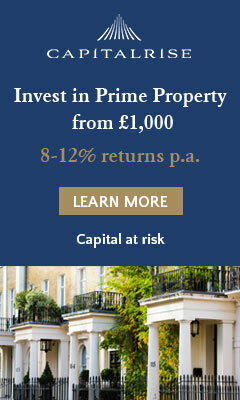 Prosperity are raising equity to add to their existing £500,000 of capital and are offering a fixed return of 15% p.a. using our Interim Equity arrangement. Holders of Redeemable Shares will receive the equivalent of 12.6% of projected net profits after tax. This will be paid as a capital gain when the shares are redeemed at a price of £1.15 per share, on or before the 31st March 2018. Figaro House is located in the middle of Bedford Town Centre, a 30 minute train ride or 1 hour car journey from London Bedford is close to other large conurbations including Luton, Milton Keynes, Cambridge and Northampton The site has easy access to major road networks, including the A6 and M1, making it an ideal location for commuters. The train station is also less than a mile away. The River Great Ouse is a main feature in the town, and is just a short walk from Figaro House. The town of Bedford is also historically significant, which adds to the charm.